We love our team and want to showcase their amazing personalities! For our latest employee spotlight, we’re featuring Evelyn Vasquez. Evelyn has been a part of the Paper Mart family for 6 years. She works wonders prepping and packing orders. 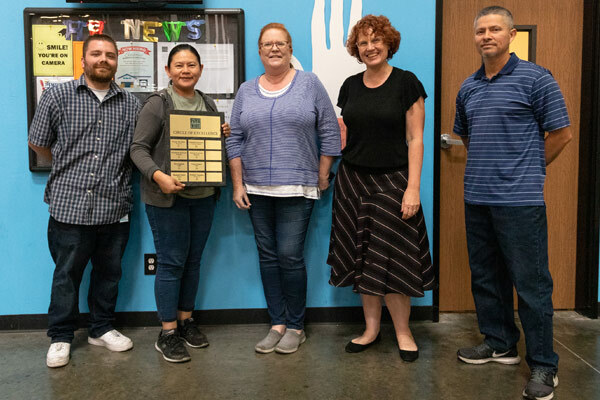 Recently, she was awarded our Warehouse Employee of the Quarter Award for Q3. She is devoted to her family, loves Salvadorean food, and grooves to Enrique Inglesias. Find out more about Evelyn here! What do you do at Paper Mart? I prepare orders and pack products for our customers. How long have you worked here? 6 years. Tell us what a typical day at work for you entails. I prepare incoming orders, first are the first-process priority orders or orders from the day before. Then I move on to regular orders by picking the products that go into them and finish by hand packing the order! What do you like best about working at Paper Mart? I’m very proud of being a part of this family at Paper Mart. What I like most is that I have the opportunity to select the best quality pieces for our customers. Their satisfaction is my priority. Before Paper Mart, what was the most unusual/interesting job you had? I worked at a glasses warehouse called Style Mark. Apart from your work at Paper Mart, what are some side projects or hobbies you have outside of the office/warehouse? I like to spend my free time with my family. My son plays soccer so I take him to soccer practice and his games every Saturday. I also like to go to church. My grandma taught me that we should thank God even for the small things. If you had to eat one type of food for the rest of your life, what would it be? Salvadorean food. Would you rather go back in time or in the future? Why? I’d rather go back in time so I could spend more time with my two kids who are the greatest treasures that God has given me. Describe what you were like at age 10. I was a very skinny girl who loved playing basketball. What is the first concert you attended? My first concert was Enrique Iglesias. What’s your all-time favorite TV show? Family Matters and Grey’s Anatomy.